Animals suffer from emotional stress just like humans, which the Bailey, Bach and Verbeia Essences are able to help. The modern world that our animals live in is far removed from their evolutionary path and adds anxiety to their daily lives. In the wild horses would explore their large environment in herds and dogs would live in packs. 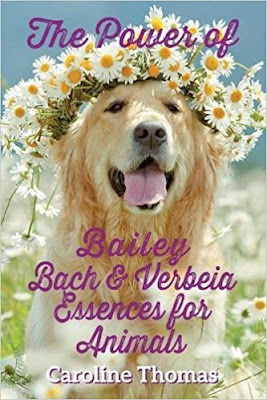 The Bailey, Bach and Verbeia Essences are here to bring back the utopia of that time, by allowing animals to live out their lives in peace. The Flower Essences are made with only the energy of the flowers so they can be taken alongside other medications; they are also 100% safe. The Essences help to alleviate, fear, grief, anxiety, separation anxiety, excessive grooming and so much more. Caroline is an Animal Holistic Therapist and writer. She has been using Flower Essences with Animals for over fourteen years and has helped many animals with complex emotional issues. She has clients all over the world who have benefited from the magic of these Essences. Caroline teaches Holistic Therapies for Animals online to Practitioner level and is also very passionate about working with Rescued Animals.